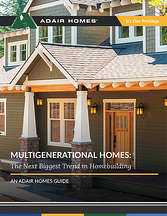 With multigenerational living a growing trend in America, it makes sense to consider how your own family might plan for the future. Whether you want grandparents to help raise young children or you must care for a family member who needs assistance, having the right home design makes a major difference. Complete the form to get your free e-book!